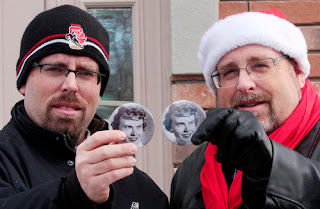 Here's a "feel-good" story about two friends of mine, Bruce and Paul Mackay. Enjoy! Bruce Mackay's mother taught him a lesson he never forgot.And on Friday, he used that message to help others. Mackay, 40, walked from his office at Mackay Insurance on Dundas Street East to his home in Corbyville, a distance of eight to nine kilometres. And though he raised more than $2,000 for local charities, that wasn't really Mackay's goal. Twenty-five years earlier, on Dec. 23, 1986, Mackay had borrowed the keys to his mother Margaret's vehicle. The family had a long driveway, and Mackay would drive the family vehicle up and down it to practice for his driving test that January. But on that day, Mackay's father, David, dropped him off at the mall; Margaret would pick up her son after his haircut. Except Bruce had her keys in his pocket. He called home — and didn't like what he heard. "I think you need to learn a lesson," Margaret said. "You need to walk." He did, heading north to Blessington Road. And every Dec. 23 since, he called his mother to remind her of what she did; they always shared a laugh about it. "Last year she said, 'Are you ever going to let that thing go?'" he said Friday, laughing. "I said, 'No.'" Margaret died in August; Bruce did the eulogy. "And now, you've gone 'home' and I'm left, once again, to walk alone," he said in closing. Since Friday marked the 25th anniversary of that first walk, Mackay decided to repeat it, though the distance would be greater. He told his family about it, asking for donations to the Christmas Sharing Program. It provides food to people in need. Margaret Mackay had long been pushing her family to forego their annual Christmas lunch in favour of donations to charity. "I was hoping to raise a couple hundred bucks," he said. About an hour before Mackay started his walk, Sharing co-ordinator Joan Elsasser was updating The Intelligencer about the program's progress. She said all the food had been delivered, but the campaign was $2,000 short of its $18,000 goal. An hour later, Mackay counted his donations prior to his walk. He was clearly humbled to learn he totalled more than $2,000 for Christmas Sharing and $170 for the Salvation Army. "It makes the hair on the back of my neck stand up when I hear that's what they needed," he said. I'm very grateful. It's humbling." "Isn't that cool?!" said Paul Mackay, Bruce's brother. "Mom's up there stirring things up." Back at the Sharing office, Elsasser's voice went up an octave upon learning the needed funds had been raised. "Isn't that just amazing! Wonderful!" she said. "There is a Santa Claus." Less than two weeks ago the program had been 20 per cent short of the target. But donations kept coming, Elsasser said. In total about 1,300 food baskets or grocery vouchers were distributed. About 115 people had registered for the Community Christmas Dinner Sunday at noon at the Salvation Army Church (Bridge Street West at Palmer Road). As many as 150 are expected. Volunteers also registered hundreds of children for the Belleville Professional Firefighters' Toy Drive. Bruce Mackay, though, didn't quite learn his mother's lesson as well as he could have. His wife, Tanya, was planning to be present as Bruce and Paul began the walk. The problem: someone had taken her keys accidentally. "I had a good laugh about that," Bruce said. "I think Mom's laughing, too."